Dana Turtle (center) with Rebeka Reames and Bob Cervas at Crimson Cup Coffee House. 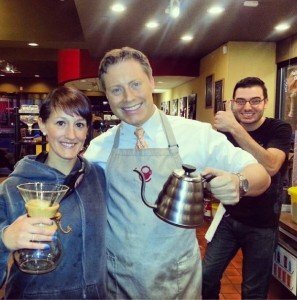 As Good Day Columbus Meteorologist Dana Turtle discovered last Friday, becoming a barista takes a lot of skill and training. Dana played barista for a day at our Crimson Cup Coffee House. Crimson Cup Barista Rebeka Reames, who has eleven years’ coffee experience, guided Dana in preparing a series of delicious drinks. He showcased the many ways we prepare awesome coffee, including our espresso machine, blender, hand-pour methods and even our Kyoto cold-brew dripper. Dana started out using a red ceramic Hario v60 brewer to make a hand-pour coffee. He then learned to make our Signature Mocha and Hawaiian Salty Mocha Freeze drinks. For his final drink, Dana used an Aeropress to make a cup of our Friend2Farmer Honduran El Socorro single-origin coffee. Watch this video to see Rebecca putting Dana through his paces. The Crimson Cup team had a great time teaching Dana. He’s welcome back at our coffee house any time.